Well, well, well, look what we've got here, deep from the confines of a Romanian iPhone aficionado store. If it looks just like the next of the claimed iPhone 6 dummies that have been flooding the airwaves in the recent weeks, that's because it is, but it's the only one snapped from all possible angles so far, and its dimensions measured with an electronic gauge. The general shape and form of the dummy jibe with the ones we've seen so far, but for the first time we are getting actual measured confirmation on the rumored 4.7" diagonal, though not on the speculated sub-7mm thickness, as the ruler pegs it at exactly 7mm, which is still very slim. In addition, the alleged iPhone 6 shell is measured next to Apple's current flagship, the iPhone 5s, so that you can get a pretty good size difference overview. The circular LED flash area on the back seems a bit out of whack, considering that we have a two-tone flash on the current iPhone edition, but let's not forget a different tech might be employed this year, and also that this might be just a placeholder for the flash on a dummy shell of a prototype, with more redesign to follow. What do you think, do you like where things might be eventually heading with the upcoming iPhone 6, if this leaked chassis below holds water when the real thing gets announced? Cool, but these bezels are still big. Where's the phone? All I see is BEZEL!!!!!! Would someone give me a legitimate reason why the bezel is a big problem? You can't expect a device to be well protected from dropping or hitting a corner if you essentially take away an important structural piece. Its a feature that people cry about that really doesn't matter, no matter what your argument is. Never ever had a problem with any phones bezel, especially a few that I don't dare to name on here without being attacked by fandroids. Really, bezel isn't a big deal. Idc what people say about it. The only way it could be bad, is if the design of the phone is ugly. iPhone never had an issue in the aesthetics department. Im with you. You can't get anymore legitimate than a compact size for a mobile phone. Mobile phone should be as compact as possible. The smart in smartphone means a mobile phone that can act as a mobile computer which requires as big of a screen as possible without killing the mobile part. What's the key to finding the sweet spot? Yes small or no bezels....only ifans would even ask a question like that instead of figuring that out themselves. This thing is the size of a GS5 with a much smaller screen. That is more than legitimate enough to want much better than this crap. Especially when you are on record of saying 3.5 and then 4 is the sweet spot for size. They could have made this pretty much the same size as the 5s with no bezels. The Moto X is small with a 4.7 inch screen and it takes drops just fine. It's not that they can't, it's they don't want to. I'm pretty sure Apple wants to continue the familiar look of its iPhone so general consumers would be able to recognize right away. Same way with car makers, they tend not to change the design of one model for few years. is it just me that think those lines around the top and bottom of the back look damn ugly ? I almost want to say LG did that first, but more than likely I'm wrong on that. Idk, it looks like a cheap clone made by a white box manufacturer. Love those bezels! They're so big, you can take notes on them! 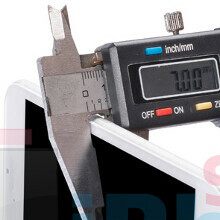 They're big just to tell you next year : "Hey fans, we made the slimmest bezels on the world". Highly doubt this is the next iPhone. Nice, but like the gs5 it has too much bezel. GooPhone is trolling all of us lololol. I thought they said new. That's exactly the same dummy being used and seen everywhere. So wait.....are they going back to a single flash?....i thought the duel flash was a big deal on the 5S, why get rid of it. I didn't see it, 1 more fail from Apple. So we can all agree that this is going to be the final design? Oh, okay. So fake! He just 3d printed this. Apple wouldn't make a phone as ugly as this. Luckily, it's just a mockup, so the real one probably doesn't have a jacked up camera and a bent-up body with 3-inch bezels.